Submitted by deserthare on March 18, 2010 - 11:25pm. Submitted by Comic on March 18, 2010 - 11:55pm. My mom actually collects Olympic cokes. Though I don't think she's even aware of the gold-plated kind, thankfully. Even if she was, I don't think she has the stamina for it... she only has one, and then one from a Super Bowl. It's still a budding collection. Submitted by kriztov on March 19, 2010 - 12:08am. wait, gold plated? So what's under the gold? Plastic? That'd be pretty crap then. If it's a glass bottle, then it might be worth it. Possibly. Submitted by kriztov on March 19, 2010 - 12:30am. wait a minute. Solid-gold-plated? Is that even possible? I thought it was either Solid Gold or Gold Plated, not both. Submitted by Ska Spooner on March 19, 2010 - 3:19am. As long as he has it, keep it in the box! it'll be worth more when you sell it off (if he can let it go) in later years! Submitted by Magiie on March 19, 2010 - 6:12am. AH! I spy Norwegian flag! <3 ! <3 ! Submitted by Ktrd on March 19, 2010 - 10:39am. It's great to realize that i'm not the only one who is letting the beard grow. Submitted by Anonymous on March 19, 2010 - 12:13pm. 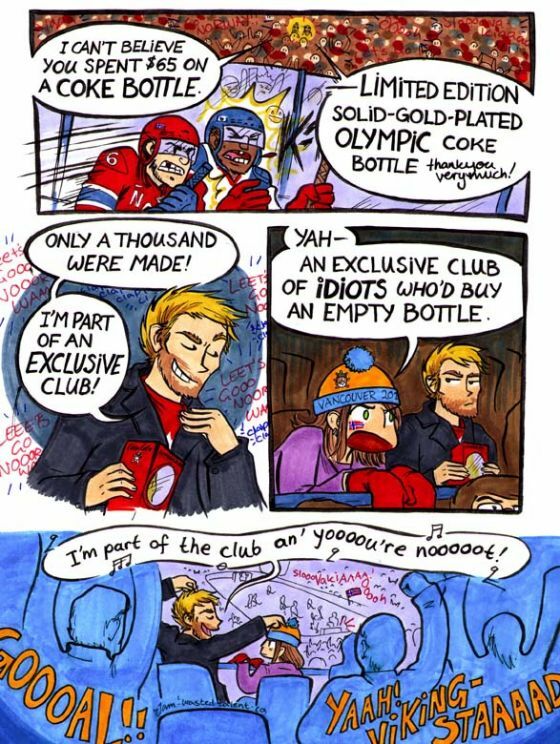 ... how did you end up in a band of Norwegian hockey supporters? Submitted by Sidhekin on April 10, 2010 - 1:49pm. I'm pretty sure I registered (for the Wasted Time forum) before posting that. Submitted by Pimp Chickens on March 19, 2010 - 12:21pm. When I read this for the first time, I thought it was the two hockey players talking to each other in the first panel. It made me laugh. Submitted by omnompineapple on March 19, 2010 - 12:56pm. Oh empty bottles, its like picking up a bottle off the street, painting it gold with little Olympic symbols over it and selling it on ebay for a million dollars. Though that solid goldness is enticing. Submitted by SpilledInkGuy on March 19, 2010 - 3:58pm. But ... it sounds so very shiny! Submitted by JayCee on March 19, 2010 - 8:50pm. you won't be complaining when that thing ebays for thousands! Submitted by Nimz on March 20, 2010 - 10:51am. Submitted by Mortosdersoulstealer on March 20, 2010 - 12:34pm. Submitted by Anonymous on March 22, 2010 - 2:22am. Submitted by Pokota on March 22, 2010 - 6:35am. I'm not sure why anyone would spend money on a solid gold plated coke bottle. Yeah, it won't dangerously contaminate whatever you put in it (unlike a plastic bottle), but it's too heavy and too valuable for me to use on a daily basis, which would be the only reason for me to buy one in the first place. Submitted by Anonymous on March 22, 2010 - 12:28pm. I definatly don't wanna drink out of anything made out of heavy metals. It probably looks pretty cool though! Submitted by I-AM-U on March 22, 2010 - 7:59pm. Submitted by 3.21.2009 on March 24, 2010 - 8:38am. I tried bragging about being in a club once. There response was that "You(I) are also in the not getting any for a few weeks club". Submitted by Kira on March 25, 2010 - 2:32pm. I bought one of the millennium versions of that! Submitted by Anonymous on March 25, 2010 - 7:02pm. Dude... that is awesome! Did you know there's a $250 *crystal* bottle, too? AND IT'S ON SALE RIGHT NOW FOR $100 OFF! I totally just bought them both. :O In my defense, it's my dad's birthday, and he collects Coke stuff too... so I'll let him pick the one he wants, and I'll keep the other one. It's not obsessive-compulsion, it's... generosity. Submitted by cynical on December 1, 2010 - 4:54pm. Submitted by A_Rod on August 25, 2011 - 12:52am. I would have bought one. If only to show my support.